Customized Renaissance Padfolio is made from Italian-style leather. 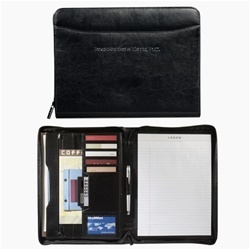 Personalized Renaissance Padfolio comes with zippered closure. Writing pad dimensions: 8.5" x 11"
Customized Renaissance Padfolio is available in Black color.